In the first week of July 2014 I conducted a journey through the Alps, beginning at the city of Aosta and ending at Evolene in the Valais. My original plan had been to climb Mont Brule on my way over the glacier from Italy, but the weather was bad that day so it never happened. Towards the end of the week I found myself not having climbed a single mountain. On the fourth of July I decided to rectify that situation, and as you shall see, the subsequent climb proved to have a positive influence not only on my Alpine holiday but on my life as a whole. Sasseneire, whose name means the Black Rock, is a mountain at once mighty and shy. 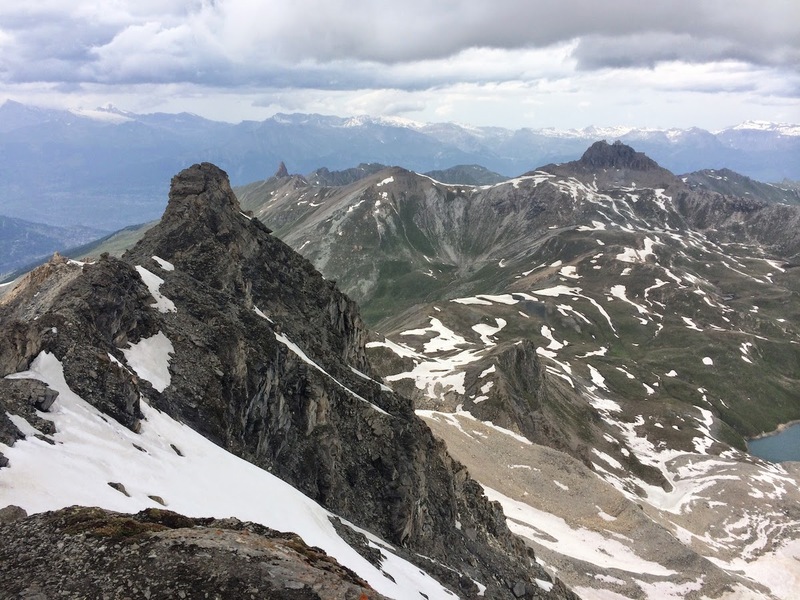 It’s actually one of the biggest satellite peaks of the main chain in that part of Valais, but is invisible from any point in the Val d’Herens and the main bulk of the mountain only comes into view once a substantial portion of the ascent has already been completed. It’s one of the easiest 3000m peaks I’ve done. There are no glaciers to negotiate, no snowfields, and minimal scrambling (although there is a lot of very loose rock). The main challenge is a physical one, because it’s a hell of a slog from the valley: almost two thousand vertical metres up and then down again. I planned my route on the map beforehand. A winding collection of roads, ancient paths, and cattle tracks climb wooded hillside to the odd little community of Villa — which is in one respect a perfectly ordinary pastoral Alpine village, but it displays clear evidence of incursion by wealthy holidaymakers. 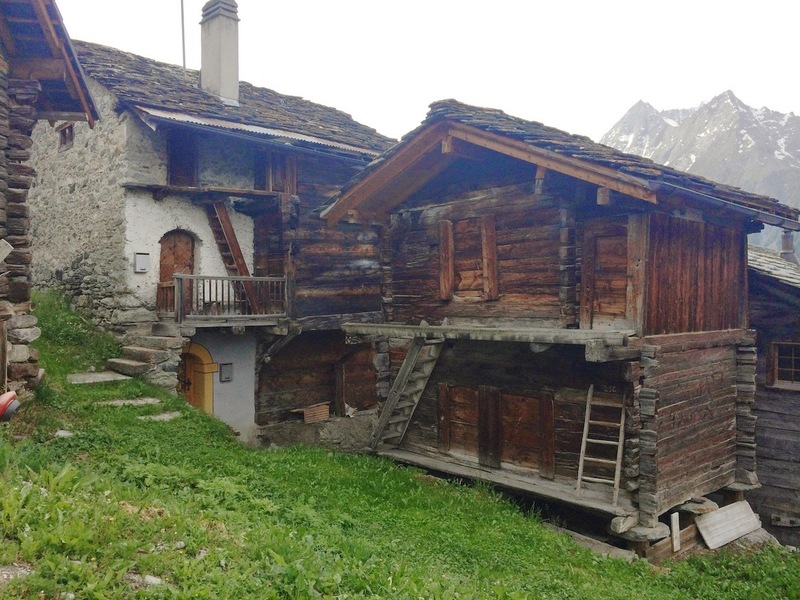 I would estimate that 50% of the houses are second homes, and the juxtaposition of new, immaculate chalets with the tiny ramshackle structures of the old village is peculiar to behold. 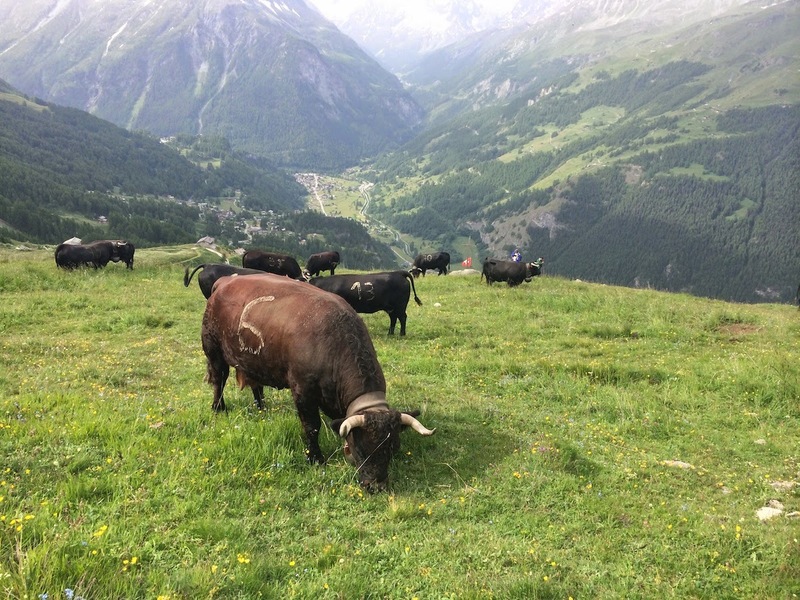 From Villa, the terrain opens up to a broad Alpine meadow, dotted with hay barns, navigated by a switchback road that climbs steadily higher through the pollen haze and the (at times) deafening buzz of grasshoppers and crickets. I strode out the miles, enjoying the expanding view backwards. The main chain was displayed to great advantage from this location, and I could see most of the peaks at the head of the Arolla glacier, in addition to the Dent Blanche and the Grand Cornier. The route consisted of a series of convexities, each of which obscured the route onward and had a different character to the one before and the one to follow. Meadows gave way to cattle pasture, which gave way to ancient moraine. These old banks of glacial debris had been softened and grassed over by the centuries, and gargantuan erratic boulders reared from the crests of ridges, fractured by a million frosts and weathered to the hue of old iron. Marmots emerged from their burrows to twitch their noses at me but capered out of sight before I could bring my camera to bear. The land grew wilder as I climbed. 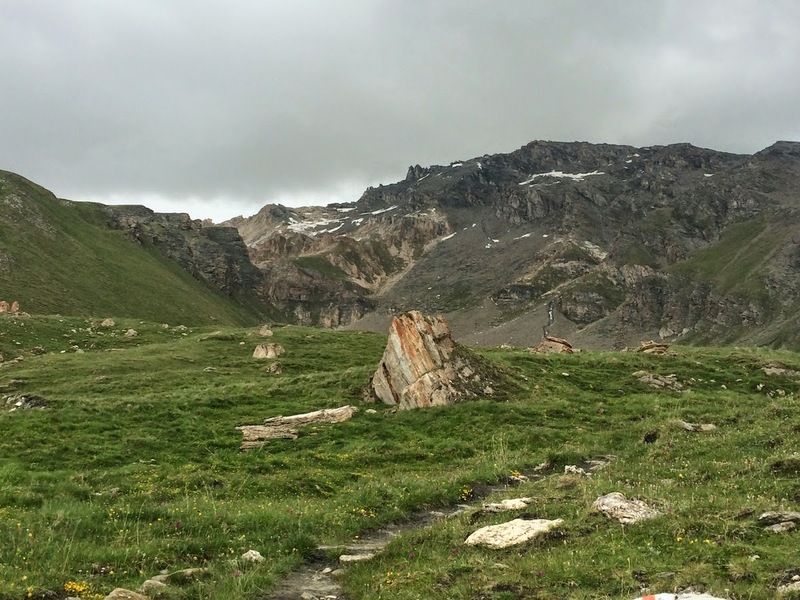 Vegetation gradually gave way to rock, and finally, just before reaching the tarn at Béplan, I saw the upper two thousand feet of the mountain for the first time. The mountain is appropriately named. A desolate cirque, filled with shattered towers and the waste of ten thousand years of erosion, guards the head and shoulders of a peak that appears at once threatening and indifferent. Dashes of snow here and there only serve to make the rock seem even more stark. Like a Cairngorm giant, Sasseneire sprawls and covers its bulk over a vast area. It certainly did not look inviting to climb. My route climbed steeply to the Col de Torrent: a notch in the satellite ridge thrown down by Dent Blanche far to the south. As I approached the col, any final vestiges of grass disappeared beneath masses of shifting scree. At almost 2,900m it felt like I was finally on an Alpine peak and not a British hill. 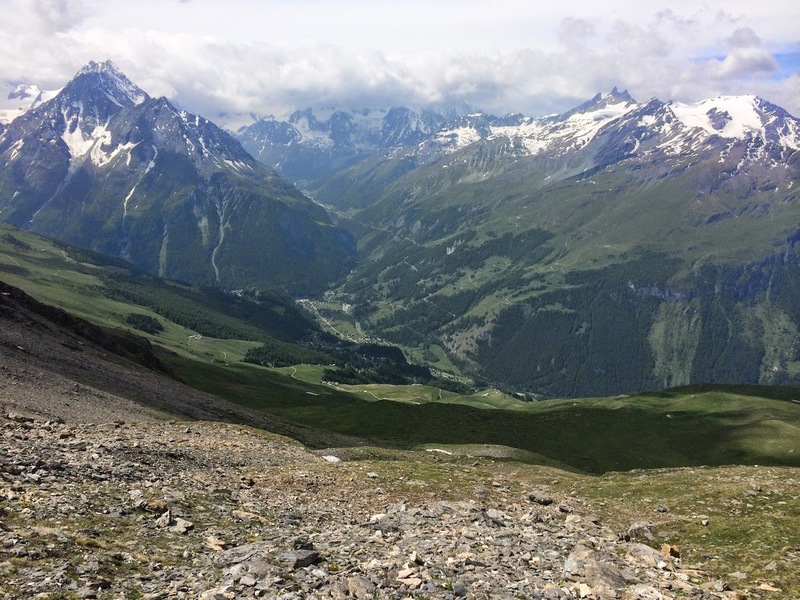 The Col de Torrent provided a good view down to the Moiry, and across to the glaciers beyond. I took the opportunity to pause and examine my route onward. The ridge extended up and to my left: an arête of shale, almost all of which had been pulverised to loose scree by the elements. My first challenge came in the form of a vertical rock step with holds that crumbled under my fingers. I climbed this tottering pitch with care, wary of the gusts of wind that blew with increasing strength from the west. With a thousand feet left to climb, I was starting to feel the effects of altitude and had to stop for deep breaths every few minutes. The loose terrain compounded my sense of insecurity. 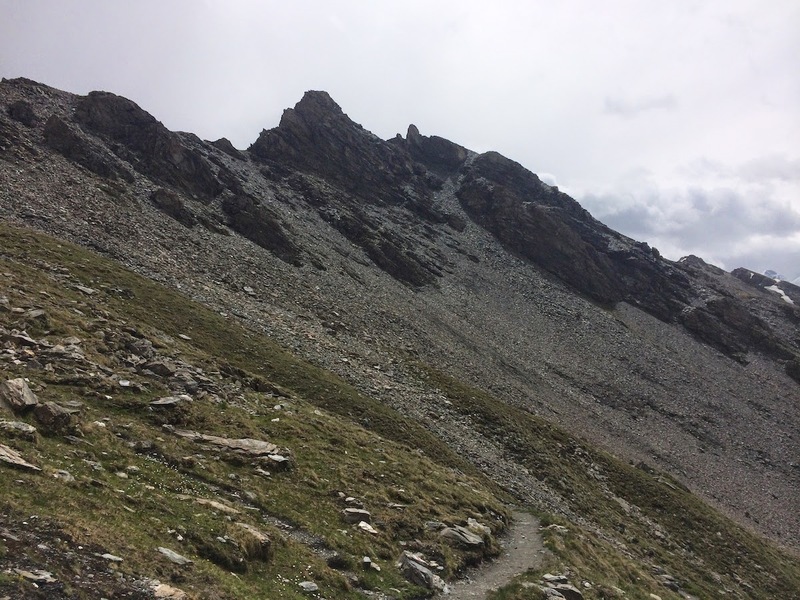 Although the going was never technically difficult, the staggering drop to my left was a constant pressure on my mind because every step had to be kicked in the finest, most unstable scree set on a slope of forty degrees. It was rather like trying to climb a sand dune in places. 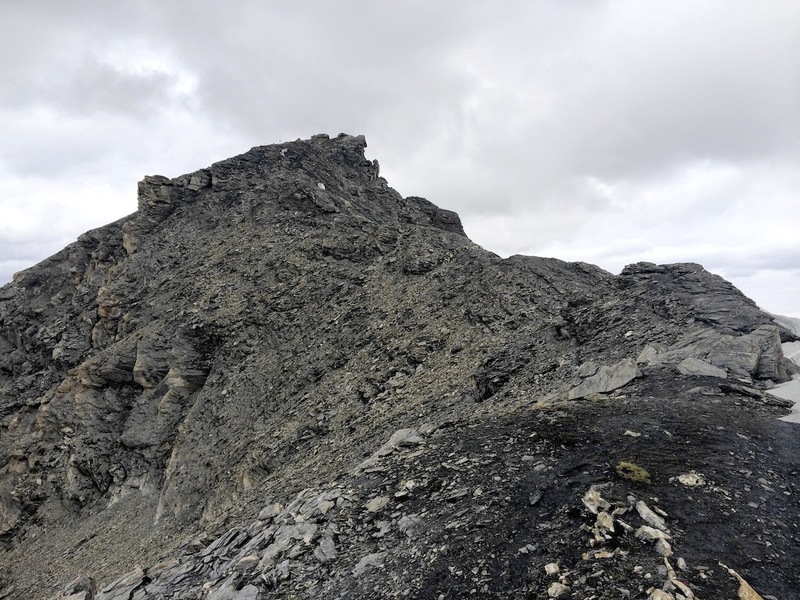 Where turrets of rock obliged me to climb with my hands, I found myself confronted by crevasses where the poorly-bonded shale had peeled away from the underlying rock, usually in car-sized chunks. I’d never seen anything quite like it on a mountain before. The dark shale soaked up the heat, so there was little snow in evidence: only the occasional hoary bank of old stuff, coated in debris and melting in the sun. A final rickety scramble on exposed rock slabs led me to the summit, where the obligatory Swiss cross marked the highest point. The wind now blew with galeforce strength, and the sun had long since hidden away behind banks of ragged clouds that threatened rain or snow, so I decided against a lengthy summit pause. Five minutes was enough to wolf down a tracker bar, take a few snaps of the view, and goggle at the stupendous drop down to the snowfields at the foot of the north face. Battered by the wind, I picked my way back down the way I had come. The combination of high winds, constant exposure, and a surface that slid and shifted under every step made me cautious. I didn’t relax until I was back on the relatively firm path of the Col de Torrent. There aren’t many options for variation of route when descending to Evolene, but I found that I enjoyed the walk more in reverse because the best views were in front of me instead of behind. 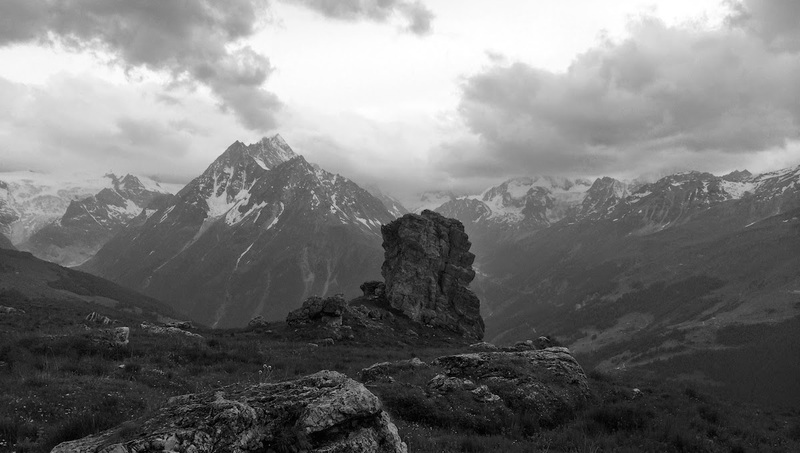 I took my time, and was fortunate to avoid the columns of rain I could see sweeping the Arolla district. All the best ideas of my life, all of the moments when a lightbulb goes “ping!” in my head and the pieces slot together, have occurred while I’ve been alone and out in the open — usually on a mountain. Ideas don’t come to me during the frantic rush of everyday life — at least, not consciously — but they require long periods of time to incubate, and further time alone with my own thoughts to bring them to fruition. For a long time, I have considered changing career. The idea of taking on work as a freelance editor first occurred to me over a year ago, but the time wasn’t right and the idea simmered away, waiting for the stars to come into alignment. Something about the expansive views on the way down from Sasseneire brought that idea out from the shadows and into the light. Perhaps it was the hours of solitude, immersed in nature, or perhaps it was because the unique perspective of Sasseneire provided a new perspective on my own life. I realised that the time was right to make a change, to stop putting time and effort into things that didn’t matter. I still had to seek advice and investigate the details, but during the course of that descent from a high Alpine peak I made up my mind to quit my day job and dare to do something different: to devote every aspect of my working life to books and writing, to finally find a day job that would work with me instead of against me. Almost a month later, I’m working out the last two weeks of my notice period and am halfway through my first editorial assignment. Pinnacle Editorial is now up and running and I’m accepting jobs. Would all this have happened if I hadn’t climbed Sasseneire that day? Maybe … maybe not. Mountains have always been places of transformation for me and I think Sasseneire will prove to have caused the most positive transformation so far. 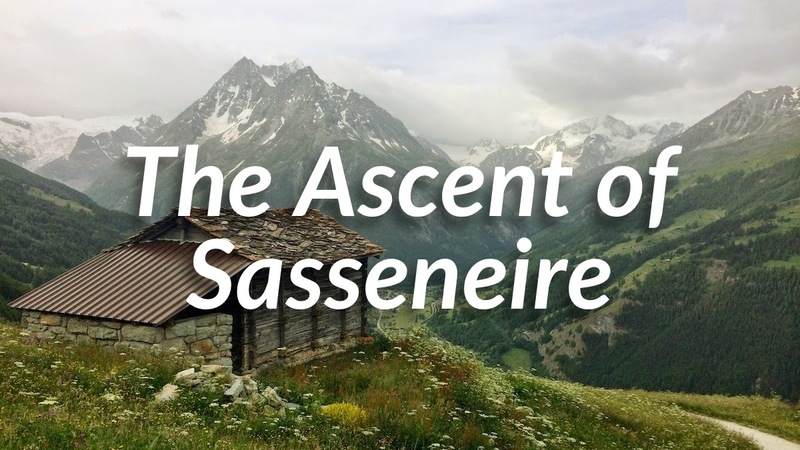 Sasseneire is one of the easiest 3000m peaks in the Alps, and during the regular summer tourist season is a practical objective for strong UK summer walkers. 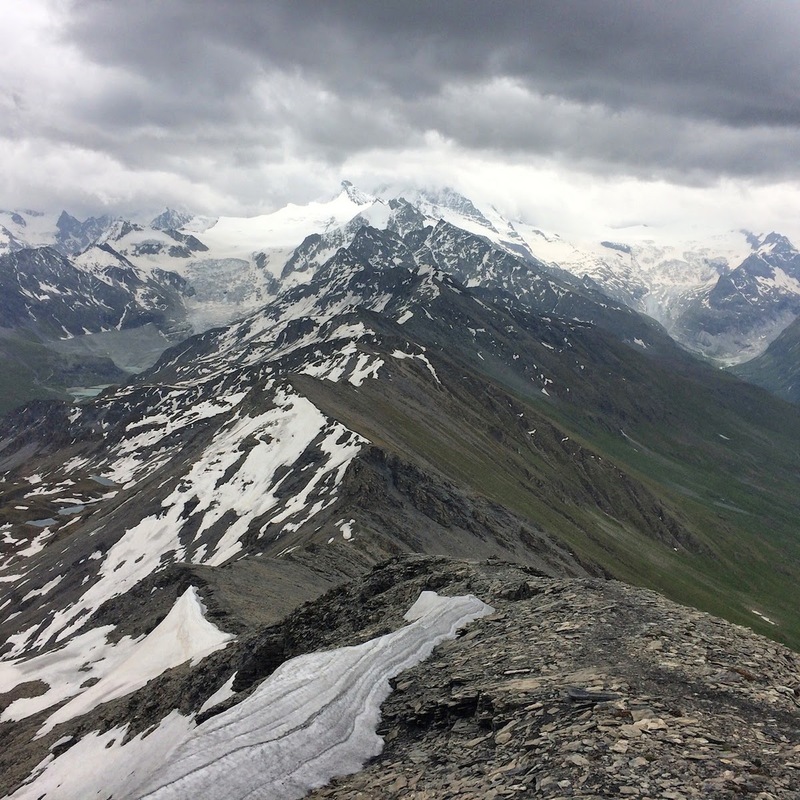 Crampons are unlikely to be required in summer but precipitation can fall as snow at this altitude on any day of the year. 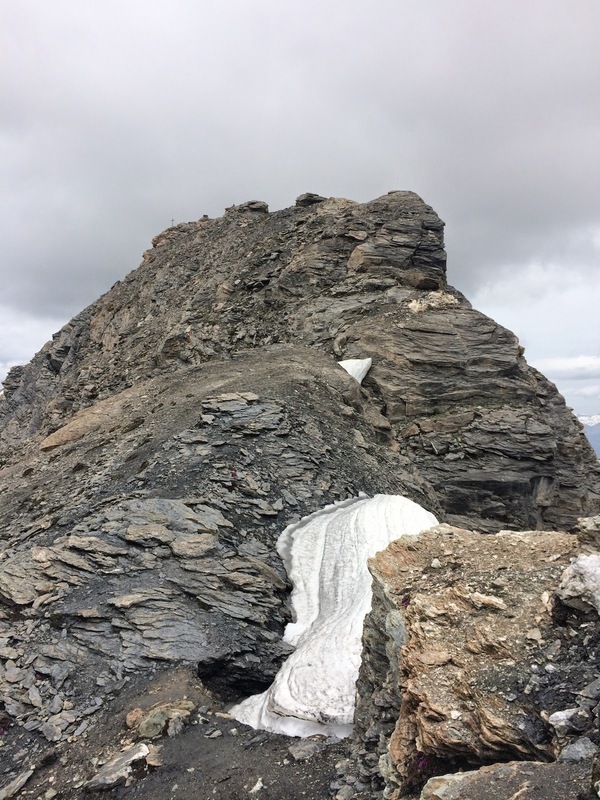 I climbed the route in approach shoes and with trekking poles; big boots and ice axe will only be required if substantial snow still remains on the route, which is unlikely in July or August. Some experience of easy scrambling and a head for heights is recommended. If you’ve done Striding Edge you’ll be fine on Sasseneire.